Warner Pacific University welcomes Michael Wilson as the new Athletic Director for Knights Athletics. The position oversees the University’s 13 varsity sports, the athletic booster club, fundraising, and Warner Pacific’s athletic facilities. A seasoned administrator, Wilson comes to Warner Pacific with a depth of educational experience as a Dean of Students, Assistant Principal, and Activities Director. He was named to the University’s top athletic post after serving as the Athletics Director for a school in Broomfield, Colo., where he led 19 sports, 37 teams, and 38 staff members. His track record includes beginning several new sports at the institution and guiding quality athletics programs to multiple conference titles and championship appearances. 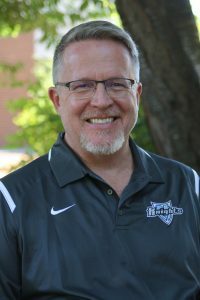 Wilson holds a Master of Arts in Coaching and Athletics Administration from Concordia University, Irvine; and a Bachelor of Arts in Secondary Education and Social Sciences from Colorado Christian University. Wilson and his wife are the parents to four adult children.